Cursery: The Crooked Man and the Crooked Cat Collector's Edition is rated 4.3 out of 5 by 179. Rated 5 out of 5 by rosekaufmann from INCREDIBLY ADVENTUROUS AND CHALLENGING Incredibly beautiful landscapes and creative, unique and very challenging puzzles and mini-games. Instructions are generally in the form of riddles and required thought on how to interpret the instructions. The many, many puzzles are a lot of fun even though, as a very experienced gamer, I had to play around with them quite a bit. Not that easy to solve. Very light on the HOS, which are very detailed and lovely FRAG. Music is lively and apropros to the scenes, but I think they could have played "The Crooked Little Man and his Crooked Little Cat" song somewhere. Voice overs are extremely pleasant to listen to. Scenes are very busy with a lot of activity to do. Map helps and the hint button works well, though I didn't use them much. Instead, I clicked on everything and read the descriptions and comments at the top of the screen because your clues will be from those descriptions (unless you want to use the SG). There are morphing objects, which seem harder to find than usual, because your eyes are filled with the busy and spectacular environments. Game is very well-thought out and gameplay can become quite complicated. Should be several hour of play for most people. I can't even imagine the fast clickers playing it in a very short time. An enchanting game and a must-buy within 5 minutes. Rated 5 out of 5 by maevekelly from A Great Blue Tea Game Review of Demo only but I am downloading the game now. I have only encountered one HO in the hour the rest have been puzzles. They are excellent. Not too challenging and novel in many aspects. The graphics are excellent which is the usual for BTG. VO good. Music not intrusive. Challenge overall is enough to keep interesting. Story is about your kidnapped sister. Somwhat sinister but I like that. There are hidden objects that are not all easy to find. There is a map with areas of interest noted. I am looking forward to playing the rest of the game. Rated 5 out of 5 by biscuitsmama from Cursery is Worthy of Ten Stars As the story begins you and your sister are traveling through the forest in a coach and she is telling you that several young women have been kidnapped while traveling on this very same road. Suddenly a wild cat stops your journey and your sister is kidnapped by a stranger wrapped in a dark cloud of smoke. As you seek to find your sister you come upon a lamb trapped in brambles and once you free the lamb Marianne appears to tell you the story of the crooked man. In order to save your sister, you must defeat the crooked man and this is where your exciting adventure begins. The graphics are exceptional as we would expect from Blue Tea Games. The artwork is stunning and gorgeous AND not as glaringly busy as they were in one previous game from this developer. The sound package is also another plus and I found it to be top-notch in every way. I was hooked on the Dark Parables games years ago and I have to say that Blue Tea Games has a way of doing sequels that are consistently good and never worn out. Shortly after beginning the game and as a reward for saving her little lamb, Marianne will appear and give you a magical, interactive map. Apparently, there are certain times that the map will not allow you to transport but that is intentional and the SG explains why this happens. One of the things I noticed early on in the game is that there seem to be fewer FROGs and far more puzzles which is something I love. The puzzles are great and seem a bit different than the standard fare we have come to expect. Some of the puzzles are more difficult than I expected and I found the first one to be a challenge. In my experience, games generally start out with the puzzles being simple and progress in difficulty as the game moves forward, but with Cursery we get a tricky puzzle minutes into the game, which indicates that we probably have a game that is a bit more challenging than usual. There are twenty cursed or morphing objects to find throughout the game and finding them causes the hint meter to refill more quickly. We have collectibles to find and if they are set up like the collectibles in the other Dark Parables games finding them will unlock portions of the story. As we move through the game we can earn an assortment of achievements, which is something many of you will like. The remainder of the CE content is standard fare and mostly stuff I don't care about with the exception of the integrated strategy guide. Since this is a Blue Tea game with gorgeous artwork, I may actually use one of the wallpapers. 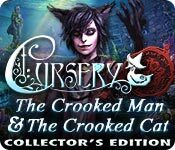 Cursery: The Crooked Man and The Crooked Cat is an outstanding game, and I would give it ten-stars if that was possible. From the beginning of the game there is something subtle that reminds me of the Red Riding Hood Sisters – one of my favorite games from Blue Tea. Since I had played the beta for this game it was an instant purchase for me and I highly recommend the game but, as always, please try it for yourself to see if you agree. Congratulations to the team at Blue Tea Games for another exceptional Dark Parables game. Rated 5 out of 5 by 43Colorado from Terrific Take on a Classic Nursery Rhyme! Based on demo. The Crooked Man and his crooked cat are kidnapping young women and your sister is taken! On your journey you rescue other kidnapped women and travel through a magical realm. This game is from Blue Tea Games and no one does the reinvention of classic nursery rhymes and fairy tales better. The artwork is amazing! Beautiful and detailed. Each scene is wonderful to look at and fun to explore. Even the puzzles are gorgeous. There is such attention to detail in every aspect of the game that it is a true visual treat! Again, the graphics are phenomenal. Just wonderful. The cut scenes are well done and add to the story. The FROGs are so much fun. The detail and clever hiding of the objects in each FRAG makes them special. There is an interactive map to help you move through the game. The puzzles are fun to solve and of medium difficulty. There are achievements to earn and morphing objects to find. This is a true CE. These updated versions of classic tales from Blue Tea really work for me. I like that the women you save are not simply damsels in distress, but just need a little help in order to save themselves and escape the villains. I also like the backstories of how the villains became villains. This game is an example of how great this media can be. Well done! Rated 5 out of 5 by beach777 from Blue Tea Games does it again! Once more, Blue Tea serves up a cup of delight! Beautiful graphics, excellent music - just wanted to look and listen sometimes wo/ even playing! All the fun collectible cursed objects - mini-games and FROGS challenging. This is a game I'd play again and that's just based on the demo! BUYING CE! Rated 5 out of 5 by pennmom36 from Crooked Man Is A Straight Up Fantastic Game! If you are a fan of the Dark Parables (who isn't?) series then you are in for a huge treat. Quite simply this is a very entertaining game with all the bells and whistles you could ask for. I knew right from the introduction this was going to be a fantastic game, the quality of the trailer was stunningly crisp HD quality, and what a story! A young Nobel fell in love with a common young girl who died suddenly leaving the Nobel empty and heartbroken! He believed the woman would eventually be reincarnated thus he kidnapped young women in his never ending quest to find her. In typical Dark Parable style the HOS are fragments that you find piece by piece until a complete item has been found, and it's not as easy as it sounds. There are 20 morphing or beyond objects to find, 14 pop up notes and 25 achievements to earn as well. Most of the mini games are new! To be honest, some of the games are frustrating but doable such as switching tiles with a certain number of items shown to their matching roman numerals but they can only be switched with certain highlighted tiles. Another game requires you to slide tiles around until the match the zodiac picture then a pattern appears and you need to click on the same symbols in the order that was shown briefly. There are a ton of mini games but not a whole lot of HOS which may disappoint some, however there are a lot of activities in every scene and there are a lot of out of the ordinary solutions which make this game a little more challenging. In conclusion I am purchasing this game and I bet you will want to do the same, enjoy! Rated 5 out of 5 by esteroverde from Blue Tea Games Are Great! Hats off once again to Blue Tea Games! The graphics are outstanding as usual, sound effects and background music are perfect to the story and this game holds your interest. HOS is challenging enough and the mini games are fun. I love to see morphing cursed objects and in this game you collect 20 of them. There are achievements to be earned and the cut scenes are done very well. It has an interactive map to jump around from scene to scene. This one will definitely be on my list of CE's to purchase when there is a good sale! Rated 5 out of 5 by LogieBaby from It's all in the storyline When I learned it was a BlueTea game I felt certain it would be a good one given the quality of the Dark Parable entries that preceded Cursory. Now that there are thousands of HO games and FROGs ( and this is of that ilk ), the player encounters the same old same old tasks. Find the feather, glove, etc. in HO scenes. Use the key to unlock the mansion gate and so on and so on. For me what now makes a new game attractive is the storyline. Cursory does not break new ground here. A man loses his beloved and his unrequited love drives him insane to the point that he kidnaps young women to find a suitable lady to replace that whom he lost. As the game progresses A( have only completed the hour trial ) the player completes FROG scenes ( 2 in the demo ) and solves many puzzles. It appears that Cursory will have more puzzles than FROG scenes. This dev always creates stunningly beautiful games and Cursory should be a fine addition to its collection. I realize there have been an abundance of fantasy games in recent weeks and this trend has left a bit of a sour taste for a percentage of players, myself included. Cursory, although a fantasy game, does not continue the trend in that it is of the highest quality. What with the Veterans Day sale, Cursory will be an addition to my repertoire of games. Thanks to BlueTea for another excellent FROG. As always, try the game and judge for yourself. Rated 5 out of 5 by Nilosh from Fairy Tales For Adults The Dark Parable series have always been amongst my favorites and now from their creators, we have Cursery: The Crooked Man. I remember the nursery rhyme from my childhood, it began with: there once was a crooked man who walked a crooked mile...... I always wondered what a crooked man would look like. Our dark tale begins with the abduction of a young girl. It appears that for more than a century, girls of a certain age have been mysteriously vanishing, never to be seen again. Rumor has it that they were taken by the Crooked Man, who always travels with a strange little black cat at his side. According to the story, he takes the girls who resemble his dead fiancé which tells us he is a serial abductor. Now he’s kidnapped your very own sister and your mission begins by solving the riddles in the Cursery and finding out who’s really is the mastermind behind this whole evil plot. This is a beautiful game with stunning graphics and artwork. Most of the scenes are dark but sharp with haunting music in the background and ambient sounds that bring the game alive. I know I was complaining about Fairy tales and cute creatures, but really there isn't anything cute about the creatures here. Main Menu offers you three levels of difficulty to choose from. You have a map that will allow you to jump as well as indicate areas of interest. We actually have a very entertaining HOPA game with Fragmented Object scenes. Actually as I have only played the demo trial, I only came across one scene and it was fragmented. 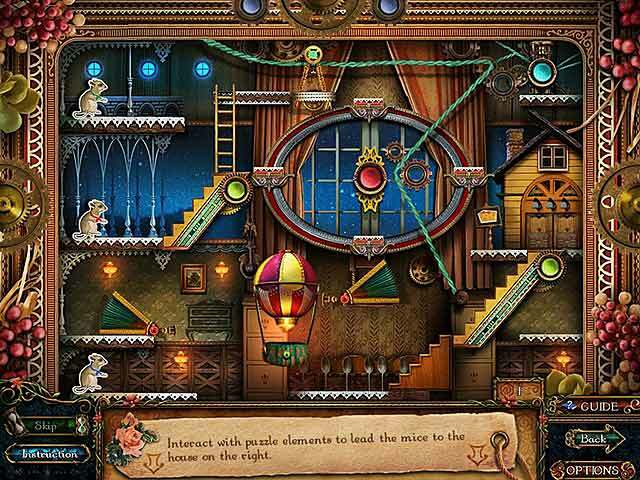 The game is riddle with puzzles and mini-games that not only are well executed, but some are a delight to play. I simply loved the three blind mice game that I cam across the first chapter. As for extras, there are plenty of them to make this game well worth the extra pennies. You have morphing objects to locate, popup notes to collect and achievements to earn along the way. Also the bonus game offers you another story of Humpty Dumpty and who doesnt love Humpty? Its dark, it’s a bit disturbing but also beautiful to look at. Although the black bar hints are a bit too much, I hardly noticed them. I think Cursery will be a hit and I expect other famous characters will be coming our way soon enough. KUDOS to the Tea drinking Group for this new series. Have a great week-end with this one! Rated 5 out of 5 by sassylassie from Awesome game Blue Tea! "There was a crooked man, and he walked a crooked mile, He found a crooked sixpence against a crooked stile; He bought a crooked cat which caught a crooked mouse, And they all lived together in a little crooked house." Well leave it up to the good peeps at Blue Tea to take this little" nursery rhyme and put an awesome twist on it in this exceptional game. I am a huge catlover, and that bad cat is right up my 'alley'. The VO's are done exceptionally well. No need for subtitles. Story: According to Marianne the dude with the cat lost his fiance and so now he kidnaps young fair maidens in hopes to get one close to his fiance. Unfortunately your poor sister got tangled up in the mess. Now it's up to you to not only save your sis, but all the ladies he captured as well. She will be one busy Missy. Graphics: Absolutely gorgeous. I love to stop and look before continuing on. Music: Beautiful done and fits great with the game. Mini games: Fun! Not to hard or easy for me, just right. Hint System: Works outside of the H0GS as well as the H0GS. Map: Jump map to make your travels a little easier. I definitely rate this a 10 no question. Awesome game and kudos to the team! Rated 5 out of 5 by simy1972 from Another wonderful Blue tea game Just finishis the demo...and wow! Wonderful graphic, nice storyline...Try it try it try it! Rated 5 out of 5 by BFGMCFFAN from Another amazing Blue Tea Fairy Tale! Blue Tea is well known as the creator of Dark Parables. This game is like a Spin-Off of the series, because there was a hint for this story in Dark Parables 5. So you can expect another high quality game! The storyline is another Fairy Tale. A noble fell in love with a woman. Then she died, before they could get married and now the noble wants to return his love from the death and kidnappes maidens for that. Can you save the innocent womans, before it's to late? The characters in this Story are drawn and good done again. They have voice overs, which are clearly understandable and have not much spelling errors, as far as I could see. The graphics are simply amazing. Blue Tea makes the best Fairy Tale theme graphics. Every Scene has so many, beautiful details and an amazing, deep atmosphere. In this game most of the graphics are a bit darker than in the other Blue Tea Games, but they just fit into the game. The soundtrack is lovely too and I love it. It really fits together with the graphics to give this game a great "feeling", while you play. The Level of challenge is very nice here too. There are FROG's, like you know them from Dark Parables. The fragments are hidden well, so you have to look closely to find them all. I really like the FROG's. Now to a big surprise for me. In the other BTG there were only a few mini-games, but in this game there are so many mini games and puzzles. And most of the puzzles are not very easy to solve. Some are quite a challenge. The developners did a great job here! The CE comes with the usual extras. I think everyone knows them. Afterall I have to say that this game combines the old BTG standart with darker graphics and many different mini-games. For me another five star game and a worthly CE. Keep up the good work BTG for Dark Parables: Jack and the Sky Kingdom CE. Rated 4 out of 5 by hermitcave from Did Mother Goose promise the Crooked Man a way to bring back his departed beloved? Riding in a horse-drawn cart down a narrow path through a darkening forest, you and your sister, Renee, are chatting when she begins a story about rumors of young women her own age being abducted along this very path never to be seen again, when suddenly, a large black cat attacks overturning the cart. As you get up, a sinister man appears behind your sister and grabs her. As you approach them, the black cat scowls and the Crooked Man creates a portal through which the cat and he, with you sister, disappears and closes. As you begin your search for where he took Renee, you save a lamb from a lynx and a spirit appears before you thanking you for saving her lamb and tells you the story of a young man and woman that were to be married but she died. This caused the man to become despondent and vowed to find a way to resurrect her somehow so be began abducting women about her age convinced that one would be a reincarnation of his beloved. Now, your sister has become his latest victim. You begin your search finding various items belonging to other women abducted and are visited by their ghosts asking for your help. To help them and save your sister, you have to find this Crooked Man with his Crooked Cat and defeat him. A dark tragedy that is probably not really for children, there were vague references to an old woman[Mother Goose?] that promised the crooked Man that his beloved could be brought back but she was never actually named. There is an old Mother Goose Nursery Rhyme about a crooked man who walked a crooked mile and found a crooked sixpence and bought a crooked cat to catch a crooked mouse and all lived together in a crooked house. The story relies loosely on this nursery rhyme and throws in a lot of material to flesh out the story but in a twisted way. Well developed and presented, this is a long, involved game with many story-driven inventory puzzles and mini games and few hidden object scenes and even a twisted ending. There is even a direct reference to Mother Goose in a poem that is found during the game - "Mother Goose spreads her rhymes, A dark tale, written line after line, With the souls that they stain, Her power does gain. Such rhymes are called Cursery." Mother Goose apparently offers items to people that make their wishes come true and it corrupts their souls twisting what they wished for. The cursed items make them susceptible to moonlight which can defeat them. Highly detailed scenes are presented with very bright, clear and colorful graphics and exceptional animations. Characters had developed personalities and their background was presented through papers found throughout. This attention to detail was also present in the many puzzles and the few hidden object scenes giving them the feel of belonging. Instructions for many of the puzzles were presented as riddles which increased their difficulty but additional instructions were available for those not wanting to figure out the riddles. Voice acting gave life to the characters and the music fit the scenes and game as a whole with many varied background sounds completing the setting. There is no journal, only a current task and there is a fair amount of backtracking that is aided by a very good jump map, but in some areas, the close presence of the crooked man prevents you using the jump map so you have to figure out the route yourself. This seemed to only be toward the end of the game. The few hidden object scenes were primarily fragmented object style [FROGS] highly ornamented and detailed. There are 20 cursed objects to be found that refill the hint button faster and a variety of achievements as usual. The bonus chapter, while referencing a character in the main story, was really a separate story entitled "Humpty Dumpty" about another man gone mad after some eating advice[tomatoes? ], again from an unnamed old woman, and your son has gone missing. He apparently has been eaten by this mad man and you have to save him before digestion starts. Very gross theme. I did not enjoy it very much and would have purchased the SE if I had known this was the bonus story. This may be what some are looking for with exceptional graphics and a weird and twisted story. Rated 4 out of 5 by interestinggal from SE or CE version? Loved everything, including the storyline, the visual, the music, the voiceovers, the wallpapers, and the concept art, especially the cat one. However, the mini games are very repetitive. The bonus game was interesting but short. Also, I don't remember any collectables or achievements. Therefore, I would recommend the SE instead of the CE version. Rated 4 out of 5 by grassroots73 from Beautiful Graphics Where to start..Well, it's a good game, as all Blue Tea are..pretty graphics, fun puzzles, a good storyline..BUT..the music was repetitive, the puzzles were a little too easy, and by the time I finished the bonus game, heartily sick of one or two of them..that said, it kept me entertained, but I'd recommend just getting the standard edition. Rated 4 out of 5 by Queen_Mab from Enchanting and Inventive This game will pull you in, you won't be able to put it down, including the bonus game, which was one of the better ones. The reason I gave it 4 stars instead of 5 is that the door puzzles become tedious after a while, especially if there is one kind you don't like (each type gets at least 3 times). Still, absolutely loved this game! Rated 4 out of 5 by nekkrogotzmija from Excellent puzzles but... Puzzles are awesome... but honestly - new areas opening too quickly and you're acquiring so many items you tend to forget where to use them. Anyways, good puzzles and nice artwork. Rated 4 out of 5 by Torpedo1 from Another Keeper Love the fairy tail theme. Got stuck a few times trying to figure out what to do. Plenty to do and loved the puzzles. The music was great and went with that odd fairy tail music used in some toon movies. The map was the cutest I have seen. Another one to put on my must have list. Rated 4 out of 5 by Cherubabies from Another Great Kitty Game! I was really impressed by the very beautiful Graphics! The Game however, was not that easy to play and the Puzzles rather difficult. I skipped most of them. One thing that surprised me to find was a Spelling error as in "Go find YOU Sister" instead of "Go find YOUR Sister." A Spelling error like this is just NOT acceptable in a Collector's Edition! How this can error have passed testing? Were the Testers asleep to have missed it? If it wasn't for this I would have given it a much higher score. Overall, a very good and thoroughly enjoyable Game. Thanks Big Fish for offering this gem to us! 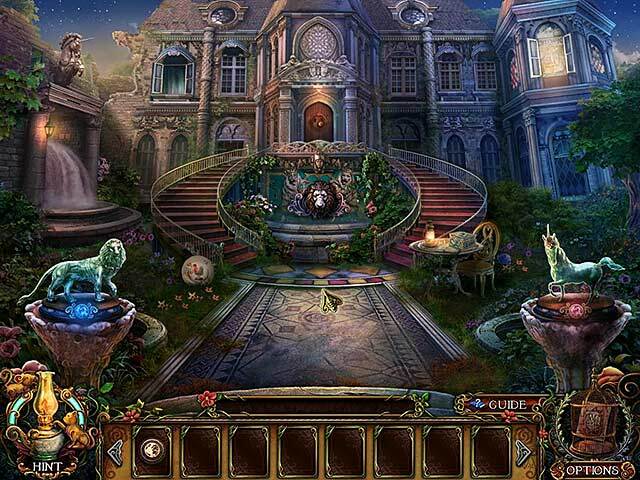 Rated 4 out of 5 by Munch126 from A decent game A puzzle heavy hidden object game. A good game but one where I would've liked finding regular objects rather than pieces of one. Rated 4 out of 5 by felinedevine from A Fun Twist On A Fairy Tale I bought this game without trying first based on the good reviews. I normally steer clear of "fairy tale like games because I don't care for them but this one was good. It is about a duke who falls in love with a commoner, and wants to marry her. That's all I will say so as not to spoil it. The colors were nice. Most of the art was crisp and clear. The music was pretty but was on a loop so after a few hours it kinda wore on me. The hos were all the same. They involved finding pieces and putting them together to make an item to be used in the game. The mini games were so so. Some were ok while others were mundane and childish. The hint system worked well for me, and I used the strategy guide very little. There is a map albeit a childish pop up map which I didn't use. There is quite a bit of back and forth in this one. A lot of different areas to explore. I liked the story line in spite of the fairy tale theme. On the other hand, the bonus game was just a silly waste of time and not needed for a conclusion to the main game. I think if I knew then what I know now, I would have preferred to purchase the se. The ce is just not worth the money unless you really rely on the strategy guide. Rated 4 out of 5 by catbag8717 from Marvelous Game, But Once Again, I Cannot Give This A Five! For as long as I've been playing Hidden Object Games, I've always enjoyed the ones by Blue Tea. However, time and time again, they've failed to wow me. This one, though... It's different. I thoroughly enjoyed my hour trial (yes, this time, it went for an hour) and I will most definitely be purchasing the SE. Although I enjoyed the game immensely, I cannot give it a five star rating. You will find out why later in the review. But first, let's start with the story. I've been critical with Blue Tea as of late for not making their stories exciting enough. It seems they've listened, because this story is marvelous! It began with a bang, and I was excited right from the get-go. Mostly, when games start well, the flame dies out about halfway through the demo, but not with this one! The story lost none of its excitement factor, and I was kept on the edge of my seat for the whole demo! My main gripes and the only flaws of this game are with the gameplay, and these flaws are the reasons why this game does not get a five star rating. For starters, the ratio of Puzzles to HOS is ridiculous. During the demo, I found 7 puzzles and only 2 HOS! If the game were to go for 3 hours, based on the first hour, this would mean 21 Puzzles and only 6 HOS. I'd prefer it if things were a little bit more even! In my opinion, there are a bit too many puzzles and not enough HOS. My second issue, and this is a big one for me, is that, if you skip a puzzle, the hint button gets TURNED OFF for a few minutes! This is completely wrong. It's like the developers are punishing those who cannot complete puzzles! This happened to me twice during the demo, and believe me, I tried and tried again, but I could not solve them. This lost an entire star for me. It's just not fair to punish people because they are not as good at puzzles as some others. Because of this, I simply cannot recommend this game to beginners. This is for people of higher skill level only. Now, on to the HOS and Puzzles themselves. The HOS were the usual Fragmented Object Scenes, in which you have to find different bits and pieces of objects. These fragments are broken up in to three different sections, and when all three sections are complete, they merge to form one item needed for your inventory. I found these to be quite fun and challenging. The puzzles are also quite challenging, but solvable, granted that they take some patience to solve. Despite not being able to solve two, I was able to solve the rest after sticking with them for a minute or two. I did quite enjoy the puzzles, too. The graphics, like always, are simply AMAZING. Time and time again, the magicians at Blue Tea give us visual delights with their games. There is so much detail and care in them, and each scene is delightful to see. Each scene and HOS is so clear. Not one scene was fuzzy. Job well done, developers. The voice-overs were standard. They weren't over-done or under-done, they were just right. No comment from me on the voice-overs. FEATURES 3 modes of difficulty: Casual, Normal and Hard. Differences are hint and skip recharge times, sparkles and black bar tips. I played Casual. Hint and Skip- both recharge fast for their difficulty. Hint is useful outside HOS, but is locked for a short period of time if the skip is used. Map- map is interactive and highlights areas of interest. “Cursed Items”- There are thirty (30) to collect and collecting one instantly refills the hint button. Not sure if these are a CE exclusive or not. CE EXCLUSIVES Built in Strategy Guide- contains step by step solution for puzzles. Given the skip situation, I needed to use it for most puzzles. Achievements Collectible notes/pop-up items Bonus Chapter Bonus Puzzles Replay Cutscenes Concept Art Music (listen to music of the game) Wallpapers So, to conclude, I really did enjoy this game, but cannot give it a five star rating due to gameplay flaws. I do not believe the CE to be worth it, so I will wait for the SE. Rated 4 out of 5 by Anigisdi from REVIEW FROM SOMEONE WHO PLAYED THE ENTIRE GAME BASED ON COMPLETED GAME ON HARD LEVEL PROS: Excellent voice overs Unique and interesting (but easy) mini-games Story builds tension the further into the game you go Music adds to the creepiness and helps get you on the edge of your seat at the end Lots of FROGS (fragmented hidden object scenes where you collect pieces of an object, combine them to make a whole, then use it in the scene) Lots of achievements Morphing objects, the more you collect the faster the hint refills VERY helpful map (on two lowest levels) which shows where you need to go and lets you JUMP to it, saves lots of going back and forth Many different scenes which are all visually stimulating in interesting ways LOTS of tasks to do Story unfolds in small bites as you advance such as finding a note which explains part of it, etc. Graphics are easy on the eyes No pentagrams, demons, or graphic violence Based on a love story gone haywire--interesting twists The MAP IS TURNED OFF on you at times to make the game more unpredictable, but don't worry, you will find your way around and it turns back on quickly CONS: The story is pretty familiar The ending is rather abrupt after a long and thrilling build up and potentially unsatisfying depending on your viewpoint Game was too easy for advanced players No map at all on Hard level which means you will backtrack a LOT BOTTOM LINE: This game has a familiar story line, but it's told in an intriguing way. It takes you on a winding journey through childhood nursery rhymes and gives them a whole new interpretation. I had a lot of fun playing it. Rated 4 out of 5 by Irmazon from Charming Crooked Nursery Rhyme Game This game is not cursed at all, but rather beautifully wrought. As you wind your way through an enchanted forest in pursuit of the Crooked Man & his Crooked Cat, you will encounter enough quirky yet charming puzzles along will objects for your quest and morphing objects to keep you busy for quite a while. 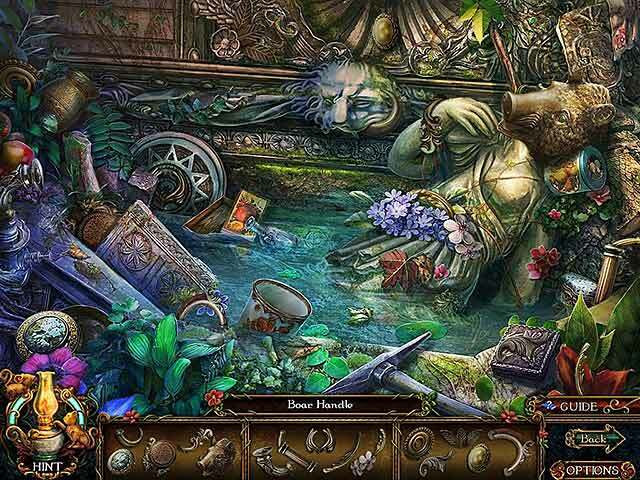 This HOPA seems rather light on the Hidden Object scenes in comparison to the mini-puzzles, which are quite a few given the 1 hour trial I played. They are not overly-challenging, however, and rather cute, within the setting of the game. I do recommend clicking on everything, even in easy mode, as items abound that you may need and there are no sparkles in easy mode to assist you. There seems to be a large number of achievements as well. The only issue I had was with the music, as I tired of it quite soon. It has a repetitious lilt, as though to be put to sleep, rather than enchant one. Other than that, this game is a nice way to spend a crooked break from your crooked day. Rated 4 out of 5 by SD_13 from Love Strikes Again!! ___BASED ON DEMO___ Immediately after simply seeing pictures of the game, I knew it was part of Blue Tea games' family. Luckily I happen to be a fan and immediately downloaded the demo. *Theme: Dark Fantasy *Keyword:Loss *Plot Run Down: As the player, you're on a quest to save your sister from the Crooked Man! A short story follows a little bit later into the beginning game play that explains why your sister, and many other maidens have gone missing, all never to be seen again. Love is a key component here which seems to be a popular catalyst not for just Blue Tea's stories, but many other stories as well. So if you happen to be tired of the romance catalyst you may want to stay away. *Sound: BlueTea always has great sound quality. Their scores are reminiscent of "dark and ethereal'. *Artwork and HOS: Beautiful drawn artwork that's clear and easy to make out. The hidden object scenes consist of you finding individual objects to create a whole, which is consistent of the companies previous games. Never disappointing though. Mini Games: So far the mini games were pretty simple, but require various steps, instead of being just straight forward. You also receive a achievement for certain mini games to don't skip. Progress and Direction: An interactive map helps you keep up with where you are and where you need to go, thanks to a new feature that specifically pin points the one area that requires an action to complete your latest task. It is marked with a red star, and all areas are updated on the map once you visit them. You can immediately teleport to your destination as well. I found that the progress part seems a tad on the slower side, and obstacles were a bit predictable. You are chasing after the Crooked Man, so you logically will probably not get too far before you're thwarted by something. It also seems a tad monotonous. You enter a scene, look around, complete the action for that scene, and continue the chase. Not very complicated, but also a tad boring. Bonuses: There are a lot of extras that come with the CE. Wallpapers, artwork, music, concept design, etc. Though most of the achievements are not based on actual hard work the player indulges in, but instead mini games that weren't skipped. It leaves a lack of accomplishment. The cursed items also reappear and there are little other things to collect as well including a bonus chapter. *Final Rating. B I would wait for the SE for now unless you are a fan or an avid collector. Rated 4 out of 5 by sfr8rfan from Crooked? Straight Up FUN! This is very fun game. I wasn't so sure at the very beginning. In the first 45 minutes it was challenging in a way that wasn't fun. Everything seemed very crowded and difficult to identify. As I played on I realized that the game is challenging and it is difficult and that's because it's good. Playing this is very much like reading a William Faulkner story. If you've not read one, it's dense with description. Those who like them would say they are rich with description and you can see the seen in your mind's eye because the detail is so great. That's the case with Crooked Man: the visuals are very rich with detail and full of color and depth. Because of this incredible detailing, the view seems crowded. I thought it was...but once I established a rhythm and got comfortable with the feel of the game the detail was a treat. I think you have to play the game for awhile to get used to it...and once you do, you'll think it's really a piece of art. The sounds visuals, as I just described, are great. The sound quality is as well, but not a very important part of the equation. The challenge is great, and in large part because of the amount of detail. There are very few HOS but they are were very difficult to me. It's hard to explain that they were hard because there was lots of "stuff" but still it didn't seem like a mess...just really well-drawn objects that also fit in well and disappeared into the background as should happen in a good HOS. There are a lot of games. This presented a problem for me at first also: the very first game was/is to me, incomprehensible. I have NO IDEA what was supposed to happen but I kept doing things and eventually succeeded defeating the game and moved forward. After this the games got easier to understand. The quality of the games, though, left a little to be desired. So: now I've told you that there aren't many HOS and that the puzzles/games aren't so great, but that the game is. My conclusion is this: I think this is a great story and if you enjoy a great story/storyline, with beautiful visuals, you will love this game. The lack of HOS and good puzzles will be a big negative for many gamers. I recommend this game but strongly urge you to take advantage of the free hour of play to see if you'll like it as well. The typical "who cares" assortment of extras is included in the CE...wallpaper, music, etc. There is a bonus chapter, there are collectibles and morphing items. The morphing items speed up the recharge of the hint button, so they really do mean something. (I'm not embarrassed to say that at the beginning, when I was kind of lost, I needed the hint button quite a bit). I hope this review helps you. If you like the standard HOS and will be disappointed with VERY FEW HOS, then you will NOT like this game. Bear that in mind when you make a decision to buy or not to buy. Rated 4 out of 5 by fe_wallace from Cursery This game was ok. The back story could have been more in-depth, but it was still fun. Some of the puzzles were tough, but there was an opportunity to skip. Rated 4 out of 5 by patricia356 from Quite a fun game with some great puzzles I played only the demo and found the game to be a hoot. All of the old fairy tale characters are rather strange and demented and while I like that twist I doubt if it would be great for young kids. One of the puzzles when getting 3 blind mice all to the door left a huge smile on my face. This is not a particularly difficult or even innovative game but is a welcome relief from some of the other really dark genres. I prefer very crisp graphics and these were a little more like book illustrations but still easy to see and enjoyable. I played on the casual setting and think most people will want to raise it a notch unless you just want to relax and play. The demo was ce and I don't know if it warrants that cost so I will probably wail until the regular edition comes out to purchase it. But I am looking forward to playing it again.